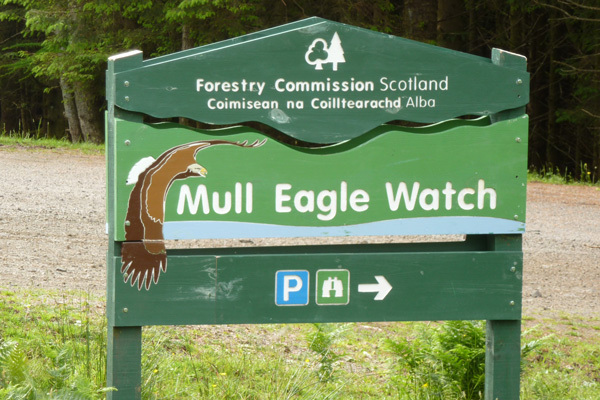 The Mull Eagle Watch is collaboration between the Forestry Commission and RSPB and provides a great opportunity to see white-tailed eagles nesting in Glen Seilisdeir on the Isle of Mull. This makes for an excellent day trip from Moidart and Ardnamurchan, taking the ferry from Lochaline to Fishnish or Kilchoan to Tobermory. There are two sessions per day at 10.00 and 13:00 on Monday to Friday. Numbers are limited to 20 per session. Booking via the Visit Scotland Information centre in Craignure (tel: 01680 812556) is essential. 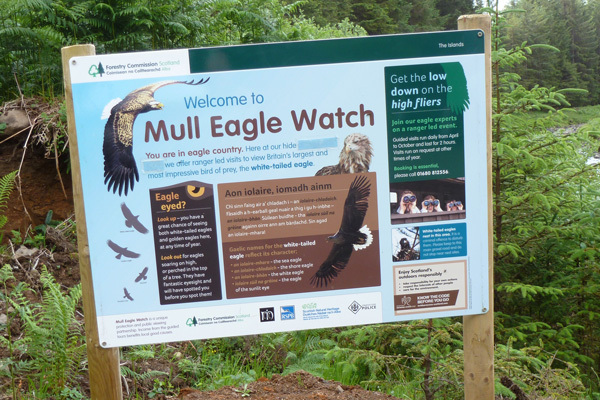 The Eagle Watch is open from April to Autumn (please see information links for details). We caught the 07:45 ferry from Lochaline, which allowed ample time for a leisurely drive around the coast on the B8035 to the rendezvous point, well signposted off the B road, along a track into the plantation forest in Glen Seilisdeir. 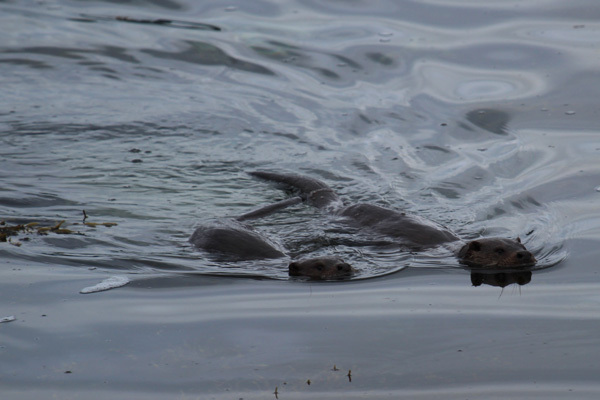 The drive to meeting point provides good birding opportunities, as well as the chance to spot otters along the coast. The warden and field officer meet you at the rendezvous point, where you are divided into two groups (pre-arranged) and payment is taken. 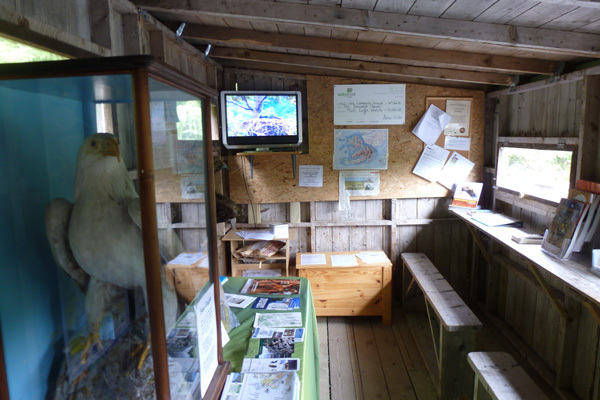 The grouping dictates which of the two activities you were do first: the site visit to the viewing hide or an interpretation talk in the wooden hide. Approximately an hour was spent on each activity. 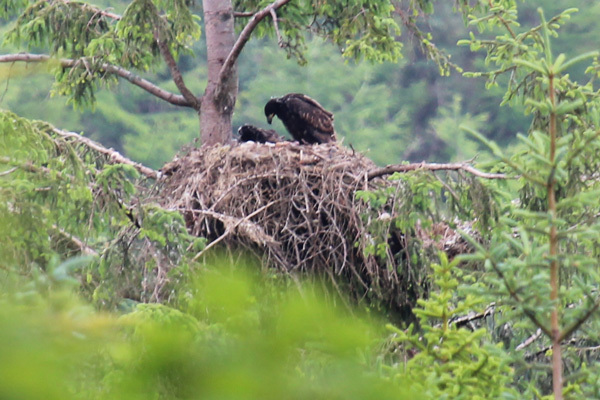 The interpretation talk provides information on identifying the white-tailed eagles, their territories, nesting behaviour and the re-introduction programme. There is also CCTV on the nest in the hide providing live coverage of the nest. 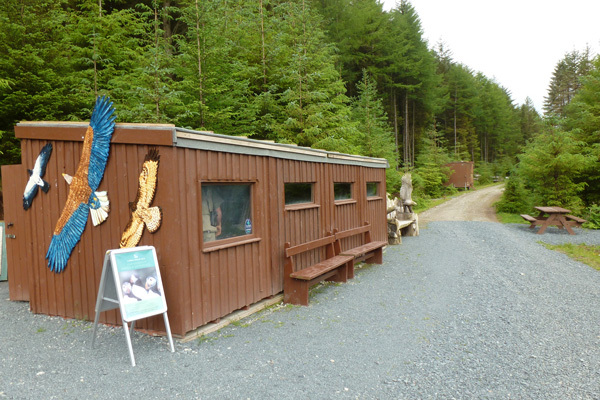 There is also a large stuffed white-tailed eagle and golden eagle in glass cases in the hide that are used for comparison purposes. 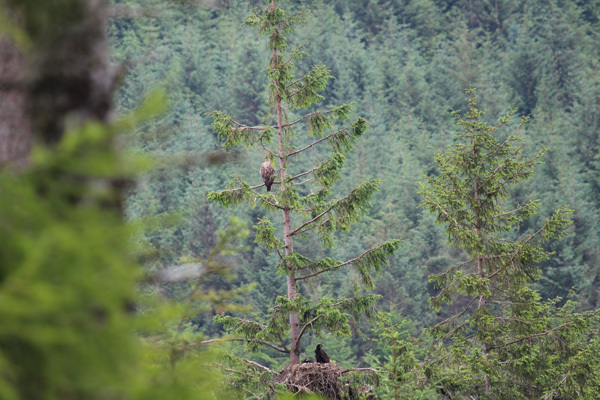 This session provides a great opportunity to ask questions about the eagles, Fingal, a 17 year old male and his partner Iona, 15 years old and their two chicks. This pair have been together since 2002, with their first successful hatching in 2003. 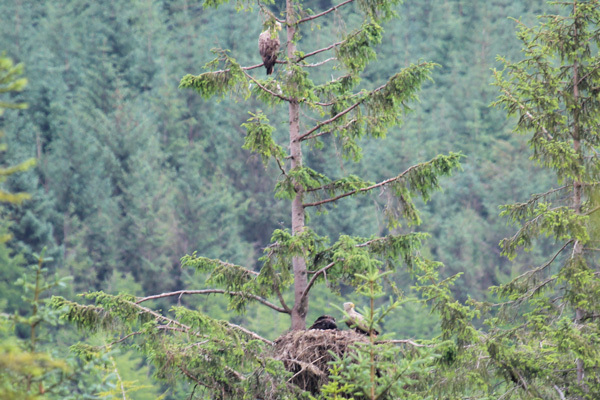 Whte tailed eagles pair for life and this pair have been nesting at this site for three years. 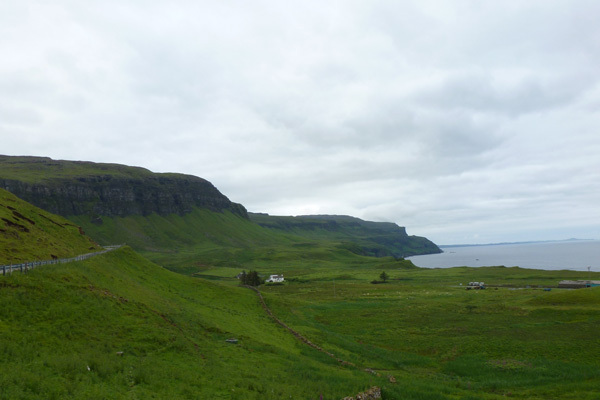 Fingal is from Norway and was part of the 1997 re-introduction programme, whilst Iona was born on Skye in 1998. The Viewing Hide is the forest looking directly onto the nest. 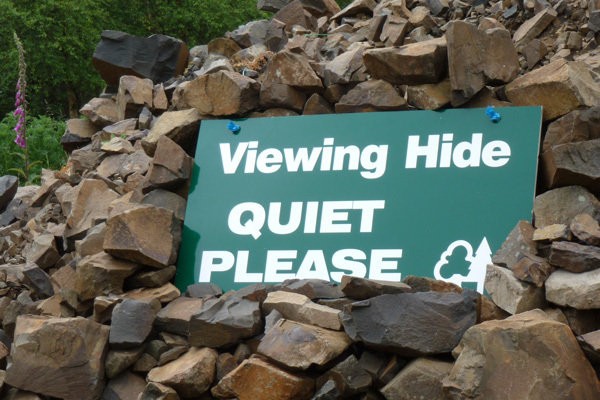 The Viewing Hide provides a unique opportunity to watch the eagles at very close range through scopes and binoculars. 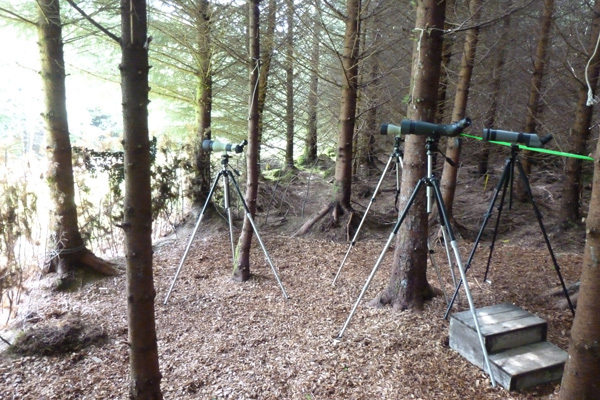 Five scopes were provided when we visited and binoculars were available on request. The scopes are good quality and well positioned so there is no real need to bring your own scope unless you particulary want to. 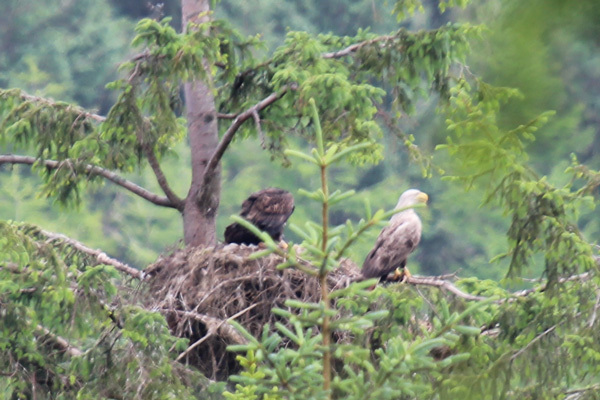 On our visit in late June 2012 we were lucky to see the larger female above the nest, with the two young 8 week old birds variously lying down, stretching and receiving food. The male visited the nest twice bringing in various items for the young birds. After your visit you can either return to the ferry or take the opportunity to explore more of this lovely island. 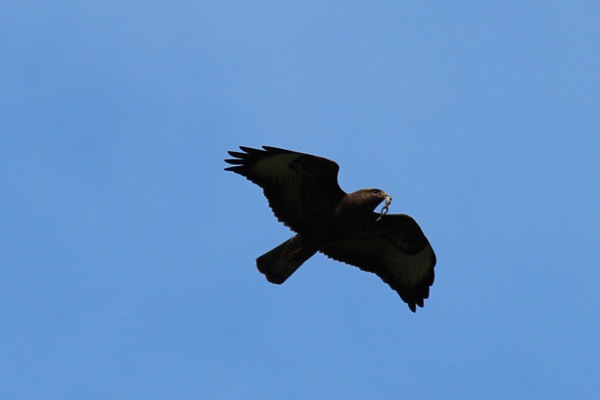 Look out for buzzard, golden eagle and hen harrier in and around Glen Seilisdeir. 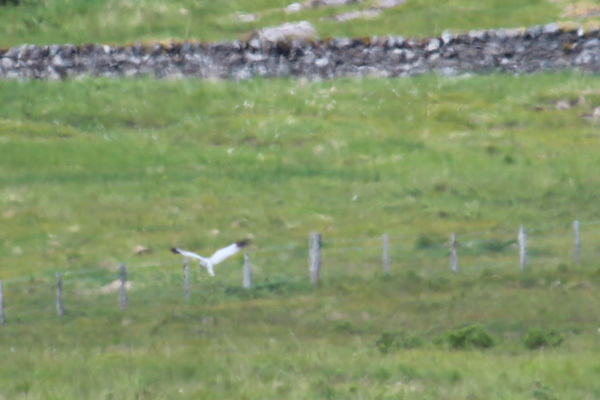 The road through Glen More also provides an excellent opportunity for spotting upland birds, including raptors, corvids as well as short-eared owls, skylark, wheatear and stone chat. There are a couple of well placed small carparks on route. 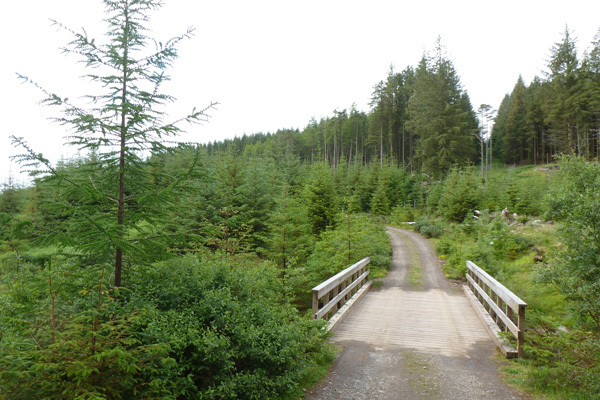 There are also number of forestry commission walks nearby. 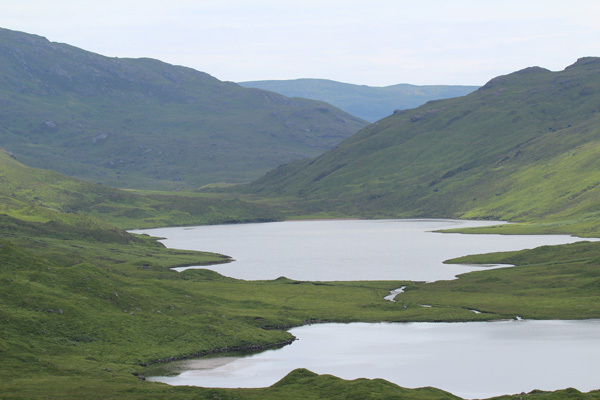 A great day out if staying in and around Moidart, Morvern and the Ardnamurchan.